I previously wrote an article regarding Florida Statutes Chapter 558 and its pre-lawsuit application to construction defects. In particular, I discussed a claimant’s (e.g., owner) requirement to submit a written notice of construction defects to potentially responsible parties and those parties rights under Chapter 558. When a party (e.g., contractor, subcontractor, design professional) receives a written notice of construction defects pursuant to Chapter 558, that party should notify its insurer (CGL or professional liability, as applicable) of a construction defect claim. This is generally the prudent avenue to ensure timely notice is given to the insurer and that the insurer starts to pay defense costs as a party participates in the Chapter 558 pre-lawsuit process. But, what if the CGL insurer refuses to pay a party’s defense costs in participating in the pre-lawsuit process set out in Chapter 558? The recent opinion in Altman Contractors, Inc. v. Crum & Foster Specialty Ins. Co., 2015 WL 3539755 (S.D.Fla. 2015) deals with this very issue. In this case, a general contractor received written notices of construction defects from a condominium association per Chapter 558. The general contractor notified its CGL insurer of the written notices of defects and demanded that its insurer defend and indemnify it in connection with the notices. The CGL insurer denied it had any duties with respect to a written notice of defects under Chapter 558 since the matter was “not in suit.” Subsequently, the insurer claimed it would participate in the pre-lawsuit Chapter 558 process, but that it was going to hire its preferred counsel to represent the general contractor. The general contractor objected and filed a lawsuit against its CGL insurer seeking a declaration of rights under the policy that (a) the CGL insurer’s duty to defend the general contractor was triggered upon the general contractor’s receipt of the written notice of defects per Chapter 558 and (b) the CGL insurer was responsible for paying the general contractor’s private counsel’s defense costs from the time the CGL insurer was placed on notice of the written notice of defects claim. Altman Contractors, supra, at *5, 6. As reflected by the CGL policy’s language, the policy required the CGL insurer to defend the general contractor against any “suit,” and the term “suit” was defined as a “civil proceeding.” The court looked at the ordinary definition / meaning of a civil proceeding and determined that the ordinary meaning was a judicial proceeding. Since the court determined that a Chapter 558 written notice of defects claim did NOT constitute a “civil proceeding” under the CGL policy, it concluded that the CGL insurer had NO duty to defend or indemnify the general contractor under the Chapter 558 pre-lawsuit process. If your CGL policy contains analogous language to the policy in this case regarding the definition of “suit,” there is a strong chance that your CGL insurer has NO duty to defend or indemnify you in the Chapter 558 notice of defects pre-lawsuit process. This means a party has to incur its own defense costs in participating in Chapter’s 558 pre-lawsuit process. This also means any decision a party makes in Chapter’s 558 pre-lawsuit process is probably not reimbursable. 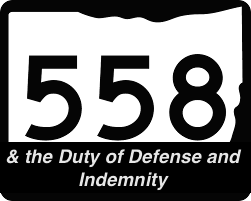 If your CGL insurer has no duty to defend or indemnify you in connection with a written notice of defects under Chapter 558, this means you need to be sued for the alleged defects in order to trigger the CGL insurer’s duty to defend and indemnify you under the policy. It is still good practice to notify your insurer of a written notice of defects under Chapter 558. And, if you are a claimant, it is still good practice to notify potentially responsible parties’ insurers of the written notice of defects. There are insurers that will assume the defense obligation at this point even though a lawsuit has not been initiated. But, as reflected in this case, the insurer may hire their own counsel instead of the insured’s preferred choice of counsel to do so (which also means that the insurer plans on using its preferred choice of counsel if/when a lawsuit is filed against the insured).